If you live in the US then you might well have heard about YouTube TV - otherwise it might be a completely new term to you. It is exactly what it sounds like, bringing live television channels to computers, mobile devices, and smart TV sets through the power of YouTube. Watching TV over the internet is nothing new, of course - BBC iPlayer has been around for years - but we're still in an age where TV watching is spread out across a combination of different technologies, devices and standards. Could YouTube TV finally change all that? YouTube is home to many a live stream as well as the usual pre-recorded videos, and YouTube TV just extends on that - through deals with the TV channels in the States, YouTube gets to broadcast those channels live in a standard YouTube window. And that YouTube infrastructure is important. In the 12 years that it's been around, the video sharing site has become slick, speedy and reliable, making video-over-the-internet look easy when in fact the underlying technology is very complex. Everything is there in terms of the network and interface - all that's needed now is the content. As we mentioned above, everyone from the BBC to HBO lets you watch live TV through an app, but what YouTube TV promises to do is take this cord-cutting a step further, ditching a plethora of individual apps for one integrated service that's available everywhere. Admittedly that's no easy task - Apple has been trying hard to get the same sorts of content on its own hardware and through its own services - but if anyone has the reach and the platform to pull this off, it's going to be Google and YouTube. YouTube TV was only unveiled in February 2017, so it's important not to get too excited or too negative about it too early on. It then launched in April 2017, in New York City, Los Angeles, Chicago, Philadelphia and San Francisco. Those cities have since been joined by more than 40 others, including Boston, Dallas, Las Vegas, Orlando, Seattle and Washington DC (check here for the latest availability details). YouTube TV will set you back $35 a month, and that gives you six separate accounts you can share between family members or housemates, each with their own viewing history and list of recorded shows. The number of channels is extensive and is now over 40: the likes of ABC, NBC, Fox, CBS, ESPN, Disney and BBC America are all on board, and you can pay extra to subscribe to even more channels, including Showtime. Companies who haven't yet signed up include Viacom and Time Warner (so no HBO): YouTube says it is in constant discussions with these hold-outs to try and get them involved in the YouTube TV project. 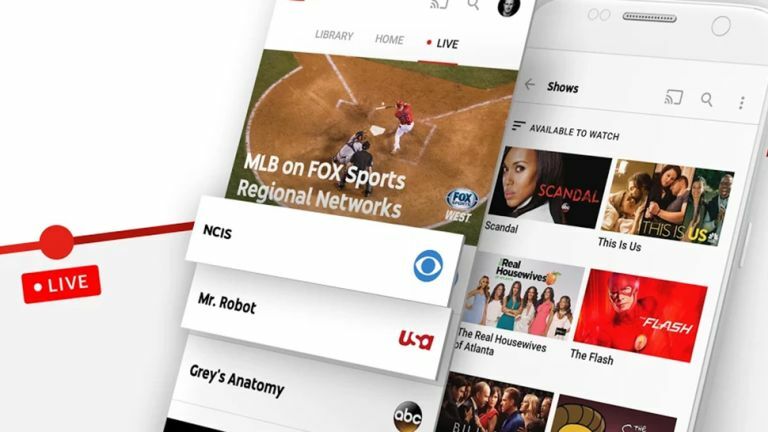 The YouTube TV app is available across multiple devices with some exceptions (like the Apple TV), and it has three main sections: Live, Library and Home. Home is where you get all your recommendations and quick links, Live is the live channels you can tune into immediately, and Library is where all your stored shows are saved. The Cloud DVR functionality built into YouTube TV is one of the most appealing features of the service, allowing you to 'record' shows as they air without taking up room on your own devices (YouTube effectively stores them on its own servers for you). You can store an unlimited number of recordings, but they expire after nine months. It's that kind of simplicity and ease of use that makes YouTube TV a compelling proposition, if you've got the $35 to spare and can get it in your part of the US (YouTube says 50 percent of households are currently covered). This being a Google product, there is of course a very handy search function too, enabling you to run a search on a whole host of content and channels in seconds. It feels like we've been waiting years for an internet service that can truly replace a cable or satellite box with a service that works entirely over the internet - this idea of 'cord cutting' makes TV watching much simpler and of course much more portable, as you can tune in from wherever you are. However, the big broadcasters and cable and satellite providers would much rather you used their own apps and services - the likes of Sky and HBO are slowly getting wise to the fact that internet TV is the way forward, but everything is still very fragmented, and it's hard to get one service that completely replaces everything the box under your TV does. With its huge userbase and pulling power, YouTube TV could be the answer. A lot will depend on the deals it can strike (and continue to strike) with the big broadcasters, who would rather make more money than make life more convenient for viewers. For those of us outside the US, YouTube is also going to have to negotiate deals with all the TV companies involved, which won't be easy (as Hulu shows). We're confident that YouTube TV or something very much like it is the future of TV - the question is how long it takes everyone else, particularly the broadcasters, to catch up.